Since widespread adoption in the early ཮s, walking frames (sometimes called 'Zimmer frames' ) have proven to be popular with those who have difficulty walking. However some users find using a zimmer can be tricky due to having to pick the frame up and move forward with each step. 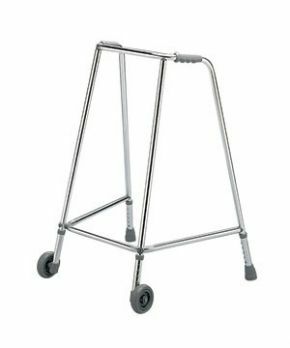 Wheeled zimmer frames improve this situation as they have fitted wheels in place of the two front feet of the frame. 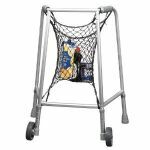 The wheels make it so that you can just lift that back of the frame and push it forwards - rather than lift the whole frame each step - making for a smoother, faster walking pattern. Perhaps it's time for a walking frame with wheels in your life?